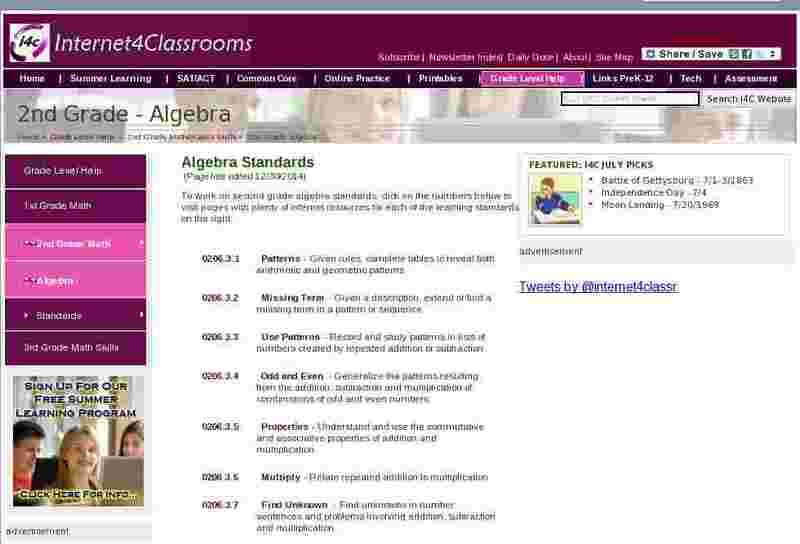 To work on second grade algebra standards, click on the numbers below to visit pages with plenty of internet resources for each of the learning standards on the right. Patterns - Given rules, complete tables to reveal both arithmetic and geometric patterns. Missing Term - Given a description, extend or find a missing term in a pattern or sequence. Use Patterns - Record and study patterns in lists of numbers created by repeated addition or subtraction. Odd and Even - Generalize the patterns resulting from the addition, subtraction and multiplication of combinations of odd and even numbers. Properties - Understand and use the commutative and associative properties of addition and multiplication. Multiply - Relate repeated addition to multiplication. Find Unknown - Find unknowns in number sentences and problems involving addition, subtraction and multiplication. Describe Change - Describe change in measures according to quantitative criteria such as growing 2 inches in one year.